Mankind has seen numerous instances of sportsmen and their love affair for specifics – whether it be Jansher Khan and his riveting eight World Open titles, or be it Ayrton Senna’s record-shattering six Formula One wins in the Principality of Monaco. However, the one highlight that stands out from these lists is the love affair of Rafael Nadal with Roland Garros. 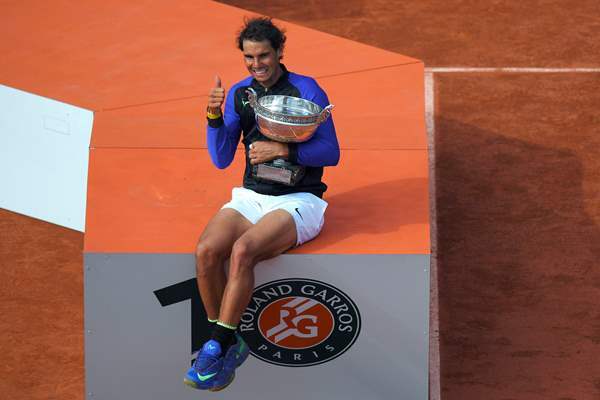 The ‘King of Clay’ has won the ‘La Coupe des Mousquetaires’ a mind-boggling 10 times and this year, he will be looking to sweep up a record-shattering 11th title in Paris. The question is can anyone dethrone the mighty Spaniard on his own turf? After a breathtaking display on the red dirt last June, Nadal concluded 2017 and began 2018 at a low ebb. He was forced to wave the white flag at the Paris Masters, World Tour Finals and the Australian Open because of injury. It seemed as if the Spaniard had once again fallen prey to knee tendinitis. Further withdrawals at the North American hard-court swings in Indian Wells and Miami followed and the season, it felt, was spiralling out of control. 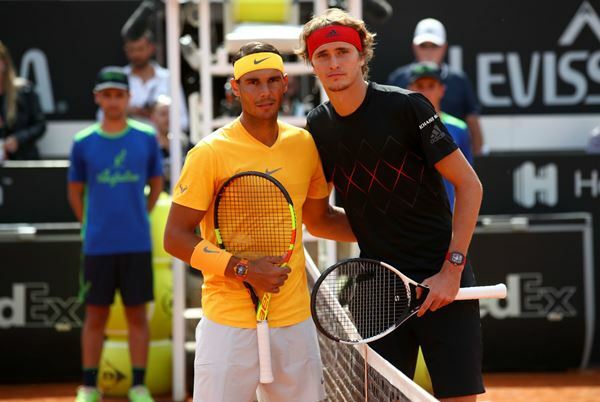 Champions, however, know how to manage their body, and ingratiated with a matador’s fighting spirit, Nadal made his return to the Tour at the beginning of this year’s clay-court season. He vanquished all his opponents, critics and naysayers alike, while sweeping the titles in Monte Carlo and Barcelona – without dropping a set! 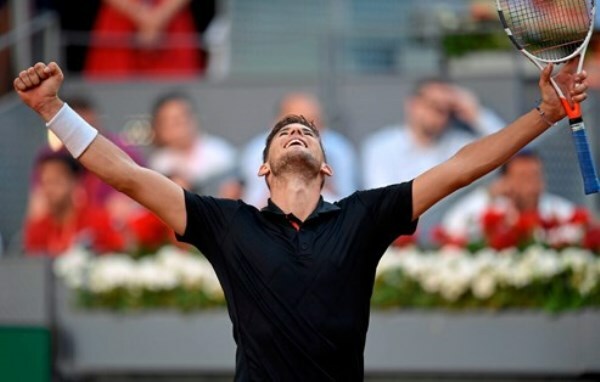 Even a stunning upset by Dominic Thiem in Madrid did little to dampen his spirits, as all hopes of pinning down the world number one were vaporised when he swept up an eighth title in Rome to leave himself as a firm favourite for the French Open. A voracious predator, Nadal knows what it takes to strike at the heart of an opponent and to leave him hapless until he waves the white flag. He has taken his game to new staggering heights this season by slightly tinkering his serve – shortening his back lift to help him generate more spin and speed on his second serve. If one is betting a man, Nadal is as safe as houses to bet on winning his eleventh title come the first week of June. Apart from Nadal, possibly the greatest challenge on the red clay will come from young sensation Alexander Zverev Jr. The flamboyant German has already upset the oligarchy of the ‘Big Four’ by sweeping up three Masters 1000 titles over the course of last year and will look to take further strides in Paris. He has the arsenal to tackle Nadal but does he have the will power to sustain the barrage of Nadal groundstrokes, remains to be seen. 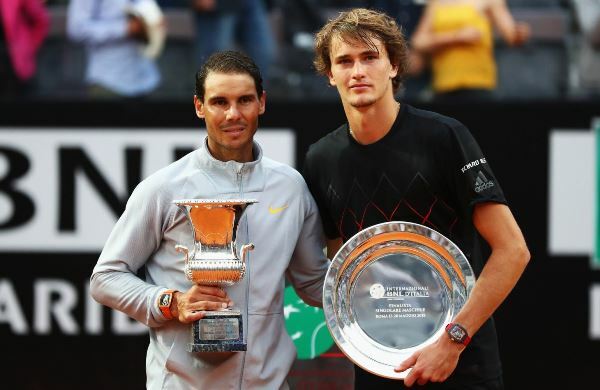 In the final of the Rome Masters, Zverev went on a tear by winning the second set in the final against Nadal and was up a break in the third before the rain gods came to the Spaniard’s rescue. The only drawback of Zverev is his inability to thus far progress in best-of-five set matches. For all his achievements on the Masters 1000 circuit, he has been a shadow of himself in Grand Slams as he has yet to reach the quarter-finals at any major. Are the Slams a bridge too far or will the German get over his hump at Grand Slams? Tried, tested and battle-hardened, Thiem is the only player amongst the Association of Tennis Professionals’ (ATP) top 10 who has a victory over Nadal to showcase on his resume. The fact the he has been the only player to topple Nadal over the last two years will instil in him the confidence that he will be able to get the job done. Nadal, though, is a different animal on Philippe Chatrier, and Thiem knows this all too well after the beat down he received in last years’ semi-final. Thiem’s serve and forehand make him a viable threat against Nadal as he is able to pin down the Spaniard behind the baseline and not allow him to dictate points from the baseline. Nadal always has problems dealing with players trying to blow him off court from side-to-side – just ask a guy named Novak Djokovic! Apart from Thiem and Zverev, there aren’t many challengers to Nadal presently. Former world number one and 2016 Champion Djokovic looked partially back to his best during the Rome Masters –but the Serbian has yet to test himself on the Grand Slam stage after being side-lined for almost a year with a hampered elbow. Likewise, 2015 champion Stanislas Wawrinka has endured a torrid 2018 season. Early losses at events, especially on the clay-court circuit, have redoubled many commentators’ claims of the Swiss having come back a bit too early for competitive action. This years’ Australian Open finalist Marin Cilic has had a forgetful past few months since his run to the final in Melbourne, and he has never likened the clay in the first place to be considered a true contender. Grigor Dimitrov has had a topsy-turvy season with mind-boggling losses – but once again, clay is not considered his forte. Other names that will try to usurp Nadal include Juan Martin del Potro, a perennial hard court specialist and dealing with a groin injury, and Nick Kyrgios, the emotionally charged Australian has the game to upset anyone on his day but there are questions over his temperament. Despite the opposition, Nadal remains a strong favourite to land the title at Roland Garros this year again. The rest of the field will need to play out of their skin to topple the Spaniard, if they are to prevent the ‘King of Clay’ from biting into La Coupe des Mousquetaires for an 11th time.